Infectious in its nostalgia gazing, The Perks of Being the Wallflower is a film that possesses the same sort of impact that a film like Zach Braff’s Garden State had on this impressionable viewer in 2004. Both pictures largely revolve on the exploits of two depressed youths, both of which have lost a significant figure in their lives while harboring resentment. Both films have an intrinsic desire to present their characters in quirky situations that impose the idea of achieving a degree of individuality. But the central figure in The Perks of Being a Wallflower is an incoming freshman, contending not so much with victimization, but rather achieving some measure of social acceptance. In Chbosky’s picturesque depiction of a youth’s social maneuvering, the audience delves into a quasi-fulfillment fantasy, as high school students attempt to achieve some measure of self-discovery. Chobosky, who adapted his own novel, has an impressive grasp of how to visualize the imagery of his novel. And with editor Mary Jo Markey, the picture unfolds through its vignette structure in brisk fashion. It’s perhaps this briskness that does Chbosky’s material a disservice though, as much individual components of the film work exceedingly well, it never does transcend the sum of its parts. The picture possesses one of the finest ensembles of the year, led by a stellar performance from Logan Lerman in the central role of Charlie. There are various touchstones throughout the picture that demands him to portray a character in the midst of developing his social language and he conveys a fish out of water sensibility with sincerity. As sincere as the emotions may be, the picture is handicapped by material that does not translate particularly well to film. The best way to describe this is by taking my previous sentence as dialogue in the film - I can simply say that the material does not translate to film and leave it at that without elaborating. 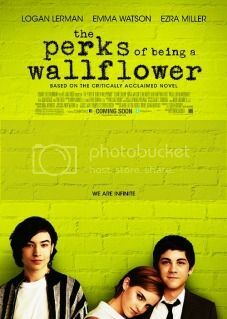 This is the sort of situation that Chbosky finds himself in with The Perks of Being a Wallflower – it’s a film of impeccable designs and ideas, but the specific details of the emotional terrain are rarely delved into. I read Stephen Chbosky’s novel in a single day within my first few weeks of college. Deeply depressed at this point in my life, I can only presume my connection with the novel was similar to what many experienced when embracing J.D. Salinger’s Catcher in the Rye. I haven’t returned to the novel since, largely on the basis of not wanting to tarnish the connection that I had with it at a crucial point in my life. Similarly, I can’t possibly dismiss Chbosky’s film adaptation, mainly because it presents so many life-affirming ideologies. Much in the same way that I embraced Garden State in my youth (a film that I still have a soft spot for, even if it’s more a relic of my past than one I have held onto over the years), The Perks of Being a Wallflower, both as a film and a novel, exude indispensable nostalgia for my youth.